After a short break – to make space for the Fridhem 2018 exhibition – we’re continuing the Best of CBK exhibition with more awesome works. And as if a whole lot of geat artworks wasn’t enough the opening of part two will also be a great oppurtunity for anyone who is curious to meet the newest members of the CBK crew. And to watch said crew members eat A LOT of crisps. Which is an artwork in and of itself. 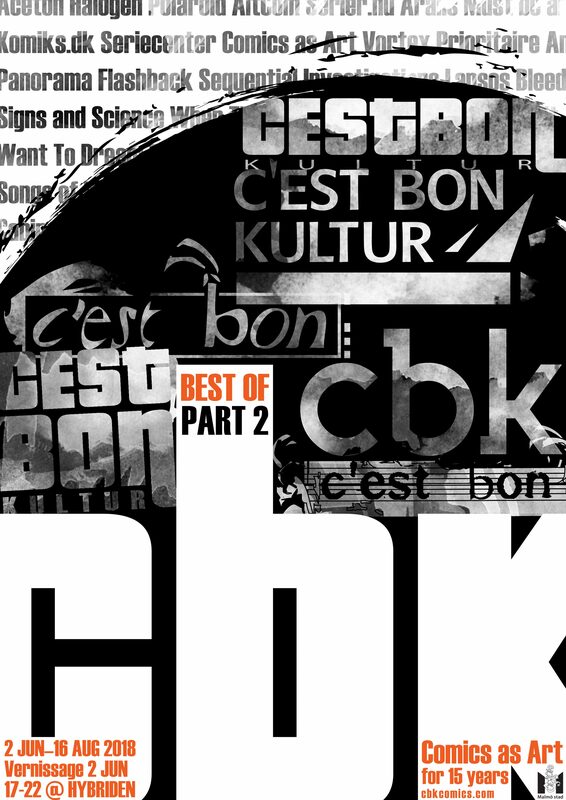 C’est Bon Kultur (CBK) became an official association in 2003, with the formal purpose of creating and promoting comics that are visually interesting and that approach comics storytelling in experimental ways. It is now 15 years later and with approximately 60 publications and about as many exhibitions behind us, we have a big selection of comics and artworks in storage that we’d like to share with the world. Nostalgia for some, news to others, we promise an interesting art experience. Big names in experimental and art comics will share the space with local talents and several generations of the CBA editorial crew. Over the years, we’ve strived to add something special in the translation from the comics page to the exhibition wall space. From acetone prints to apocalyptic scrap metal installations with DIY polaroids, blown-up postcards and blood-splattered plastic covers. One motto that runs through it all is: COMICS AS ART, ART AS COMICS. Feel free to invite people to the Facebook event. The exhibition is presented in cooperation with Fanzineverkstaden, with support from Malmö Kulturnämnd. Bjud gärna in dina vänner till vårt event på Facebook. Next Next post: Table reservations are open for AltCom 2018!